Velazquez is an undersized righty with minimal physical projection. He has filled out his 6-foot-0, 180-pound frame and is a good athlete. Velazquez starts on the first base side of the rubber from the stretch. He then uses a short quick step, similar to if he started from the windup, which seems to make timing him difficult for hitters. Velazquez uses a high three-quarters arm slot and a medium leg kick. He has a short arm action and gets some deception from keeping the ball behind his body until late. He gets good extension and his delivery is low-effort. He did a good job repeating it through out the 6 1/3-inning outing scouted. Though Velazquez’s raw stuff doesn’t stand out, he has an advanced feel for pitching and advanced command-and-control profile. Velazquez’s fastball sat 89-91 mph for the duration of the outing, with one exception: In the sixth inning, with the bases loaded and no outs, the best hitter in the Scranton lineup, outfielder Clint Frazier, came to the plate. Velazquez was able to dial it up in this at-bat to 93 mph, showing that he can reach back for more when he needs it. Though his fastball has only average velocity, the pitch plays above that due to his command of the offering and its late life. Hitters didn’t seem to pick up the pitch until late and really struggled to square it up. Velazquez also showed the ability to command the pitch to all quadrants in the zone, primarily doing so in the bottom third unless he was looking to elevate when ahead in the count. Velazquez also mixed in a cutter at 86-88 mph. The pitch had short, horizontal movement, and he was able to both run it in on the hands of left-handed hitters and to jam right-handed hitters. Velazquez featured three off-speed pitches: a slider, a changeup, and a curveball. None showed better than average, but when used in sequence and located they were all effective. All were effective to various degrees. Velazquez’s slider ranged from 79-83 mph, but looked like two different pitches at times. In the lower end of the velocity range, the pitch rolled to the plate and lacked tilt, but in the upper end, it was sharper and showed some bite. Velazquez threw his changeup 81-83 mph. He had feel for the pitch and threw it with the same arm speed as his fastball. It was somewhat inconsistent, but did flash late, downward action on occasion. Velazquez didn’t use his curveball much, but interestingly it was the only secondary pitch with which he recorded a strikeout. He threw the curve 70-74 mph, and at its best the pitch showed 12-to-6 break and depth. For the most part, it was a show-me pitch used to steal a strike early in the count. One of the few times he didn’t use it early in the count was against Frazier in the at-bat described earlier. With the count 1-2, he threw his best curveball of the night, a 74-mph one that got Frazier way out in front, swinging badly over the top of the pitch. While none of Velazquez’s secondary pitches stood out individually, having three secondary pitches he could throw for strikes allowed him to keep hitters off balance. Though he doesn’t have a standout pitch, Velazquez has the chance to be a spot starter/swingman-type arm at he big league level. He lacks a true plus pitch, but has a solid five-pitch mix. He can throw all five of his pitches for strikes and showed a willingness to use any of them in any count. This kept hitters off-balance all night, and though he didn’t get a lot of swing-and-misses, hitters struggled to square him up. 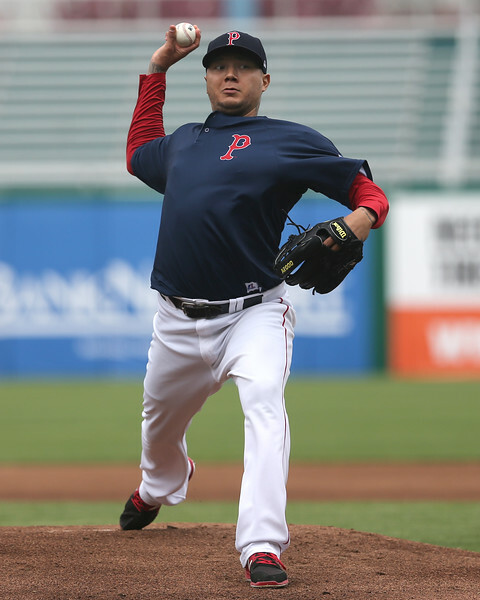 With the Red Sox dealing with injuries to David Price and Steven Wright, Velazquez represents an intriguing depth option going forward if nobody from the group of Kyle Kendrick, Brian Johnson, and Henry Owens is unable to fill the spot starter role adequately. Though he probably will not be the next in line to get a call, particularly given how his workload is still being managed, it wouldn’t be a surprise if at some point this summer he finds himself on a major league mound.